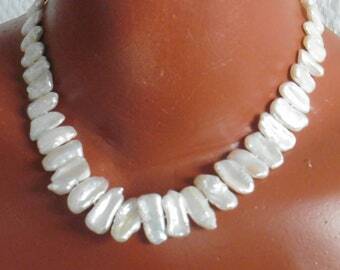 A pearl necklace of best quality, the individual pearls are up to approx. 29 mm long and approx. 10 mm wide. The total length of the necklace is 48cm. The colour is pure white, the shine and the skin are best quality. The clasp is gold-plated on silver, between the beads flash a total of 9 balls of real 14 carat gold. 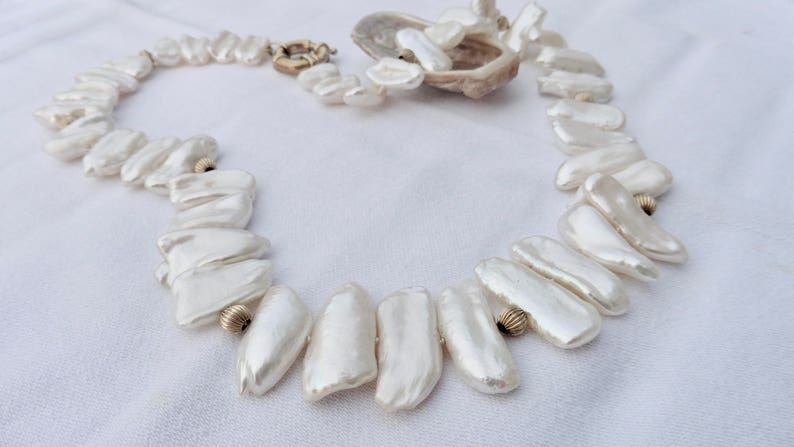 Keshi pearls grow in both salt and fresh water and are always formed when the pearl mussel repels the implant before the growth process is completely finished. The mantle tissue of the pearl oyster breaks open and pearl sacks without a core are formed. Keshi pearls are therefore special seedless pearls because there is no implant inside. Keshi beads are mostly relatively small and consist of 100% pure pearl substance. The chandelier of these beads is therefore really breathtaking. 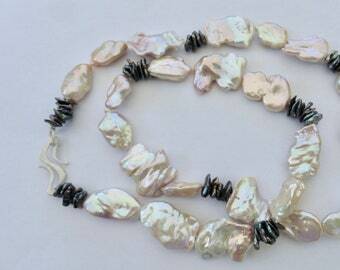 Keshi pearl necklaces are currently among the most sought-after pearls. The very large spring ring made of 925 Sterling Silver gold-plated allows a very comfortable closing. The gold balls in between are made of real 14 K gold. Total length: 48 cm, if necessary the length can be changed. Pearl size: up to 10 mm x 29 mm.